Last Friday, a piece I wrote about making apple butter ran on Simple Bites. For those of you who’ve been reading this site for awhile, the technique won’t be unfamiliar to you. It’s essentially the same one I use for all my butters, including the blueberry butter that was so popular this summer. With apple butter, I cook the fruit down into sauce on the stove top or in the slow cooker. Then, using a slow cooker, I cook the sauce down into butter. With this last batch, I did a bit of experimentation with my newer slow cooker (for the blueberry butter, I used an older one that has a lower cooking temperature). What I found is that the “warm” setting on my newer cooker (vintage 2003) was quite similar to the “low” setting on older cooker that dates to the early seventies. In case you were wondering. Now, as far as apple butter goes, it can be canned without any additional sweetener. However, I typically find that a bit of cane sugar, brown sugar, honey or maple syrup brightens the flavor. I don’t like artificial sweeteners, so I don’t use them, but they could also be used in this case if you tend towards them. So, how to use all this apple butter that you’re cooking up in your slow cooker? Personally, I like it stirred into greek yogurt or slathered on peanut butter toast. You can also use it in place of applesauce in baked goods. For instances, it would go nicely in my Maple-Banana Bread. I also like the looks of this Apple Butter Bread. Consider subbing some apple butter for the pumpkin puree in these spiced pancakes. Use it as one of the moisture lenders in a granola recipe. Now for your ideas! How do you like to use apple butter? I couldn’t imagine “losing” apple butter in the matrix of any breads. Sliced on buttered bread is divine. I make a huge batch of apple butter every year so I’m always looking for new ways to use it. Thanks so much for publishing this! I have half a bushel of apples from a local orchard on the counter waiting for processing! Yummy, I bet the blueberry butter was outstanding. I love blueberries. i like to add just a wee bit of spice to my apple butter; Chinese 5 spice has warmth and a little kick of heat to make it a nice pairing with yogurt, pork chops or cheese. You have named them all. I made some applebutter over the weekend and have been eating it with peanut butter, in yogurt mixed with that granola recipe which I also made this weekend. Delicious. One of my favourite ways to eat apple butter is with cheese on home made wholemeal bread. I make coffee cake, and swirl it on between the batter and the crumb topping. Sometimes I put a spoonful in the middle of muffins. I’ve just started canning and think this may be a nice way to use up some apples from the local orchard. My mother used to make cream cheese and applebutter sandwiches when I was little in place of my favorite PB&J (still is and have one packed today for lunch!) It was always a welcome treat. These recipes all sound so good. I make a sweet potato soup that I swirl about a half a cup into…http://www.epicurious.com/recipes/food/views/Sweet-Potato-Soup-with-Buttered-Pecans-13324 and it adds a bit of spice with the savory flavors. Delish! Thanks for the ideas…I’m stopping at the orchard this weekend! Can’t wait! I stir my apple butter into steel cut oats, and I also use it in baked apple cider doughnuts. Oh, and I almost always use maple syrup as my sweetener – yum! This is our favorite new snack: Take whole wheat pita bread and cut it into triangles. Separate the triangles and place them rough side up on a baking sheet. Spray with cooking spray and sprinkle with cinnamon and sugar. Toast them in the oven until they reach desired crispness (I like them to still be a tiny bit soft in the middle and crispy on the edges). Let them cool a bit and dip them in cold or room temp apple butter. Nobody in my house could get enough of this! I like apple butter or pear butter with cream cheese on a bagel or english muffin 🙂 DIVINE! I canned applebutter also and besides using it on toast and biscuits I make this dish with sweet potatoes as a great side dish. I have added my apple butter, which won a blue ribbon at the county fair, to fudgey brownies, but usually I just eat it mixed with yogurt over granola or on peanut butter and toast. It’s the one type of fruit spread that I find can go in pint jars and get used in a relatively short time frame. I like the idea of using it in granola. what kind of apples do you use to make apple butter? also what is the best kind to make apple sauce? I like apple butter on potato pancakes. I’ve never tried making it in a slow cooker, and have used the oven at around 200 F for many hours, like 12+. Apple butter is also really nice with some sort of booze added, like port or even whiskey. I just made and canned fantastic apple butter from Ashley’s recipe in Homemade Living. It turned out great!! I love putting it on pancakes or on Neufchâtel cheese spread on toast or a mini-bagel. we use it on toast in the morning- its a nice way of getting one more serving of fruit into the kids! i’ve been using it also in pancakes, as the glue in my granola bars, topping brie on a cracker, i made a ton so a lot of it will be christmas gifts as well….i love that the recipe is literally chop some apples, put in slow cooker. cook. occasionally mash….. I love apple butter on whole wheat toast or whole wheat pancakes. I will have to try it in my granola next time around. Thanks! I have an odd request: Could you post a photo of your apple butter cooled and like on a spoon? I always wonder if I cook mine enough. I love it, it is yumyumyummy but I’m filled with self doubt about its consistency. Thanks for your fruit butter making guidance, I have reread those posts many times! I like apple butter in a sharp cheddar grilled cheese and as a filling for apple layer cake with brown butter caramel frosting. for a quick german type cake I like to make a sweet yeast dough and put it on a half sheet. Cover it with homemade apple butter and top with streusel. Everyone loves that and best of all it’s so easy. I LOVE apple butter. It’s the very first thing I canned years ago, that got me addicted to the process! And I have a friend’s 4-year old who has very discerning tastes and of course begs me to make it each year! haha! THanks for posting! I just made my first apple butter! I’d actually never had it before, but I needed to use up some apples. It’s super good, and we have, of course, been eating it on toast. I love the ideas here! We make grilled sandwiches with apple butter, sliced turkey, provolone and thin sliced apples on wheat pitas. It is great for kids since it is a little sweet. you asked how we would use apple butter. I can’t think of any better way than a spoon and a jar of it. Apple Butter is one of my all time favorite taste. Sounds delicious atop a cinnamon raisin bagel… but I could get more creative. What about an apple butter panini? Coat the outside of the bread with apple butter, then inside put a bit more, plus some brie, a thin slice of apple, and maybe a slice of ham or turkey? The apple slice, of course, seasoned with cinnamon… you’re really starting to hook me on the apple butter concept, wow! I cannot wait to make apple butter! I mix mine with cottage cheese. It looks a little funny, but tastes amazing! ha – the PA Dutch buffets always have cottage cheese and apple butter side by side. It’s a very good combo, actually. I forgot about apple butter. You’ve inspired me to consider making it. Yes, cottage cheese and apple butter is a classic Pennsylvania Dutch combo. It’s my favorite way to eat apple butter. I just adore reading your blog… and I use the apple sauce and butter that I make to create a sauce for pork. Just stir some in to the pork drippings left in the pan that you cooked in, add some cream and you have a beautiful sauce for both pork and potatoes. I put mine side-by-side with cottage cheese as well. I don’t mix them because you lose the punch of the apple butter flavor. Instead, I scoop up a bit of each on a spoon. Yummy!! I add apple butter to my favorite apple pie recipe -for my recipe check out the Favorite Apple Pie post on my blog Sheep, Spinach and Strawberries- and it is so good! It adds another layer of apple flavor to what’s already the very best apple pie. Yum. I love apple butter on hot biscuits. And I’ve got an apple butter pie bookmarked that I need to try. Thanks to you, I have apple and blueberry butter canned in our pantry. Recently, I had a windfall of bananas and I tried slow cooking those down to a butter (adding some vanilla bean and nutmeg). Delicious! I eat it with my breakfast of oatmeal or wheat germ, Fage yogurt and the banana butter. Fantastic way to start the day. Your posts have fruit butter caught my interest and so when I came across a recipe for Caramel Spice Pear Butter I had to give it a try. You can read about it at my blog to which I have mentioned yours. Thanks for your inspiration! Hi Thanks so much. I use fruit/apple butter with thin sliced tart apples,thin onions and some vinegar and lean pork of about any kind ,in a slow brown on the stove or oven in a heavy cast pan and then deglaze with apple juice for my secret recipe . I found your site looking for a memory check? I want to use my crock pot to make apple butter and I have over 2 cases of nothing added commercial type apple sauce ? I have brown sugar . I like a lot of the stuff you said, It seems I have used small amounts of cider vinegar here where you use lemon? I plan to use the sauce ,brown sugar,small amount of vinegar and cinnamon,allspice then slow cook .But I can not can this and need to freeze ,about how long will this last in the back of my frig. Thanks again Rick Wichita Ks. I love apple butter on french toast, with a little sour cream, pecans and maple syrup. Sounds strange, but I had it at a fine restuarant and I have repeated it at home, it is delicious. Thanks again this was just the reminder I needed . I just started the sloww cooker this morning and my “low” setting is about like the one you described. I am using 3 qts. of commercial unsweetened applesauce plus 16ozs. of commercial unsweetened diced pears and I found some sorghum syrup and some brown sugar I will use about 3/4 of a cup total and a 1/4 cup cider vinegar . I dropped part of a smashed vanilla bean in here and a small amount of allspice . If this does not thicken to where I want it I will consider adding tapioca starch to make it spreadable for p.b.j.’s . I made 150 jars of apple butter for my daughter’s wedding. Each guest received a jar. I made it all in slow cookers and canned in a water bath. Some had sugar and others had Splenda. The last step before putting it in jars was to use a handheld blender to get a smooth texture. I found that apple “seconds” worked well for 1/2 the cost. It was all a great success. I LIKE MY APPLE BUTTER CHUNKY – I COOK MY APPLES UNTIL IT IS DONE BUT A LITTLE CHUNKY. I TTURN STOVE OFF AND PUT IT IN JAR’S THEN PUT THEM IN HOT WATER BATH FOR 20 MINUTES. WHEN I GET READY TO USE IT I FIX SOME TOAST AND SPREAD SOME ON AND IT TASTE LIKE HOT APPLE PIE. and often give a jar of that at the same time. 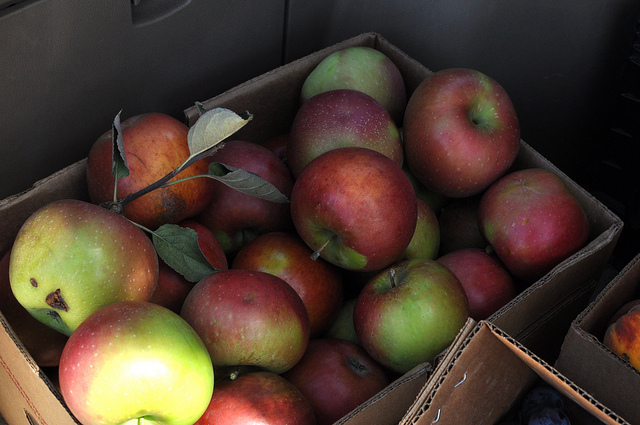 Note: I find that late season apples, like the Gold Rush variety, have much better flavor than early season apples. I also buy the seconds by the half-bushel for half the price.